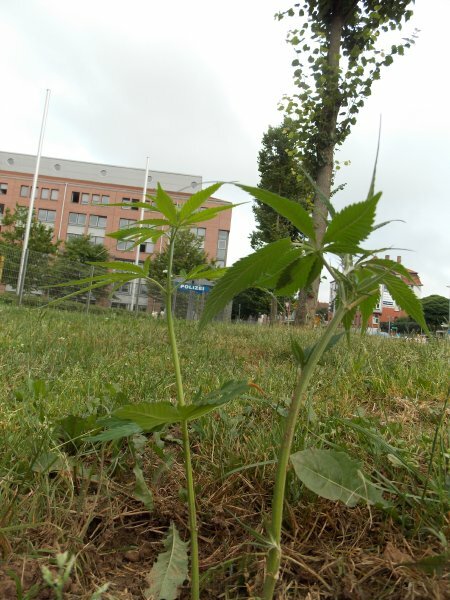 A few cannabis plants sprout up in front of the police station in Göttingen, Germany. Activists in Germany are demanding the legalization of cannabis – and they have taken to the city streets (and flower beds) with their message. A group called A Few Autonomous Flower Children have announced that they are responsible for the planting of several pounds of cannabis seeds around the town of Göttingen, Germany. The group organized an effort to cover the city with seeds in June, and now their protest crops are sprouting up all over – in parks, flower beds, and even in front of the city’s police station. Police have been less than amused over the situation, and have been trying to combat the rogue plants; but with more and more cropping up, they certainly have their hands full. According to police spokeswoman Jasmin Kaatz, everywhere seeds could be sown, cannabis plants are sprouting. Against Nixon and the policies against the War. very nice action, this innocent plant should be legalized. Very powerful painkiller for people with pain. But guess the pharmacy would not be happy to lose clients and will block legalization. If the leaders in government would smoke a joint they would have more peaceful thoughts of sharing and not killing people in wars.